It came into existence in 2004 by the usage of federal law. It is done to teach the citizens about the Constitution especially to students in Schools those are funded by federal agencies. However, with time, the day has grown much longer. Nowadays, it is celebrated as long as a week in towns and at universities and schools. This year, it is celebrated on September 16 as September 17 falls on Saturday, weekend. Below is the list of 9 essential online resources which can be used to learn more about it. 1. 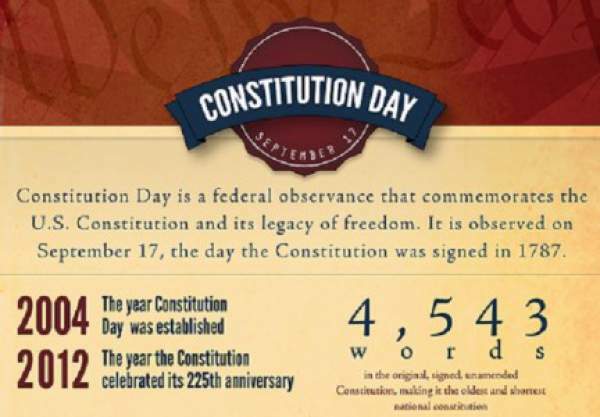 The part of Public Law 108-447, an appropriations bill, actually established the Constitution Day. 2. A copy of the Constitution at the National Constitution Center’s website. Here is the link: http://constitutioncenter.org/interactive-constitution. There is more online version. The official US Archives page at http://www.archives.gov/exhibits/charters/constitution.html. It has text and photos of the original documents. And it has an excellent review of the Constitutional Convention of 1787. 4. Take an interactive quiz at http://constitutioncenter.org/foundersquiz/ to match yourself to some of the founders. 9. Before this constitution, USA had another one which was used in different ways from 1777 to 1789. It replaced the Articles of Confederation and Perpetual Union when the current one was approved. Stay tuned to The Reporter Times for latest news and updates. Don’t forget to share it on social media sites. What are your views and thoughts regarding it. Feel free to share with us. Next articleWWE News: Bill Goldberg vs Brock Lesnar To Be The Main Event In Wrestlemania 33 (2017)?